ALICE´S ADVENTURES IN WONDERLAND. BOOK PROJECT. 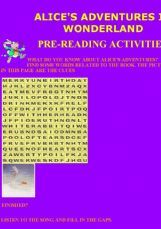 Interactive game.10 slides to practise possessive case, possessive adjectives and family vocabulary. Wrong answers vanish and right answers get a "right" sound. Easily editable to add your own exercises. It´s my first interactive ppt, I hope it´s useful to you. Facts about New York city. Listening activity using Tim Burton´s Alice soundtrack. 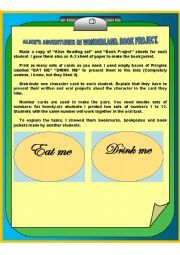 This term we´re reading Alice´s adventures and I use it as an introduction to the reading.